When 1kg of moisture is delivered to the air by an adiabatic humidifier, 680W of evaporative cooling is achieved. 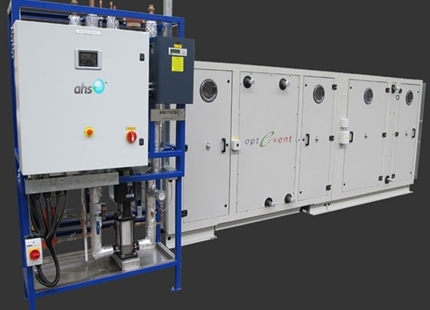 As a single adiabatic humidifier can provide up to 1,000kg/h of moisture from as little as 300W of electricity, their potential for providing low cost cooling in air handling units is great. Humidity is added to the incoming fresh air stream, reducing its temperature whilst increasing its humidity. This conditioned air is supplied directly to the room with a high percentage of the room air being exhausted, rather than re-circulated, to maintain a low humidity level in the room. The amount of cooling that can be achieved depends upon the humidity level of the incoming air stream. 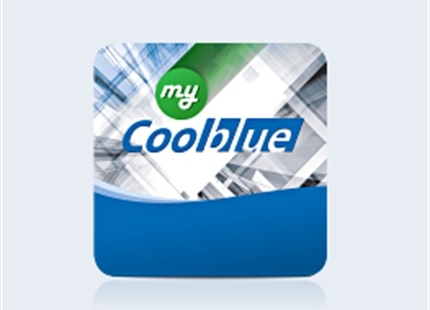 Air with a lower humidity will absorb more moisture, resulting in a greater evaporative cooling effect. This strategy uses the outside air to cool an internal environment without any mixing of the internal and external air streams. Fresh outside air is run through the AHU's heat recovery (HR) unit and then exhausted, while the return air from the room is run through the HR unit before being re-introduced to the room. When the external air stream's temperature is cooler than the internal air stream, its cool thermal energy is transferred and cools the room. By humidifying the external air stream prior to the HR unit, its temperature is reduced, enhancing the cooling capacity of the system. This allows an in-direct cooling strategy to be used even when the outside temperature is warmer than the desired supply condition to the room. A higher velocity on the external air stream than the internal further increases the cooling capacity of the system. The air extracted from the room is first cooled by the humidifier and then run through a HR unit before being vented outside. The cool thermal energy provided by the humidifier is transferred to the incoming air stream by the HR unit, cooling it by a few degrees and reducing the required load on DX air conditioning systems. As there is no mixing of the humidified exhaust air and the incoming fresh air, there is no moisture added, so cooling occurs irrespective of the incoming air's humidity level. 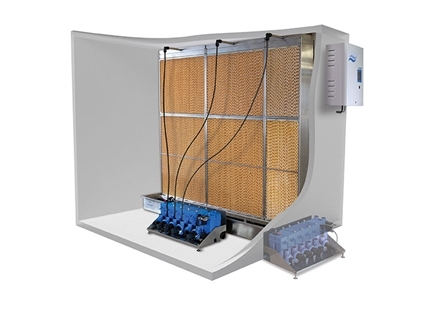 Get advice from an AHU evaporative cooling expert. Fill in your details below.